Proof of Alliance favouritism – The Green Winter Clothes Scandal! As a tailor, I like having as many recipes as I can lay my little gnomish mitts on. 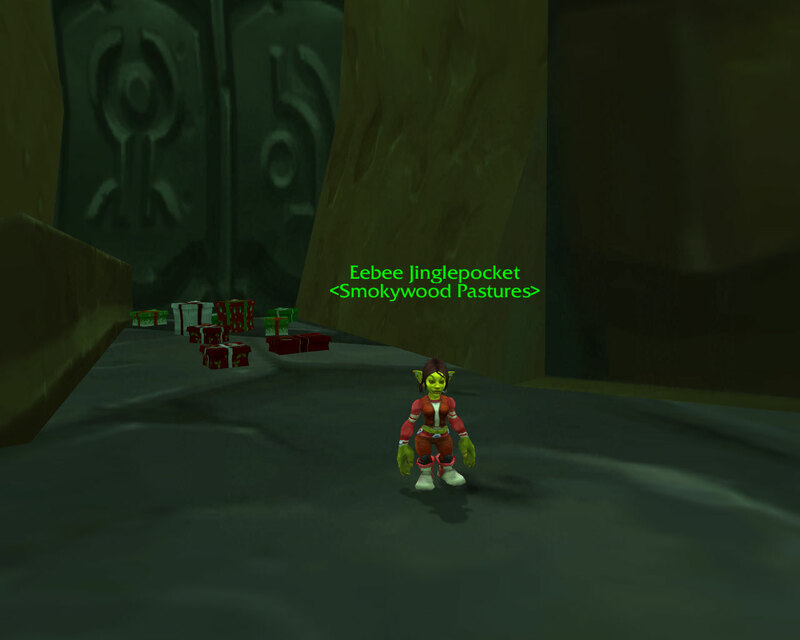 So during Winter Veil, I knew I had to acquire the Green Winter clothes on my Gnome Priest. From previous years, I knew that you could buy the opposing faction’s recipe from their cities so off I went. However, it was only after a quick trip to Thunderbluff to buy said recipe, I got around to looking at WoWhead. Can be found loitering outside the Aldor bank. The Horde on the other hand, have to journey to either Stormwind (crawling with Alliance), Ironforge (crawling with angry Lumpyless Alliance) or that Draenei dump that’s in the middle of nowhere to buy the Red Winter clothes recipe. 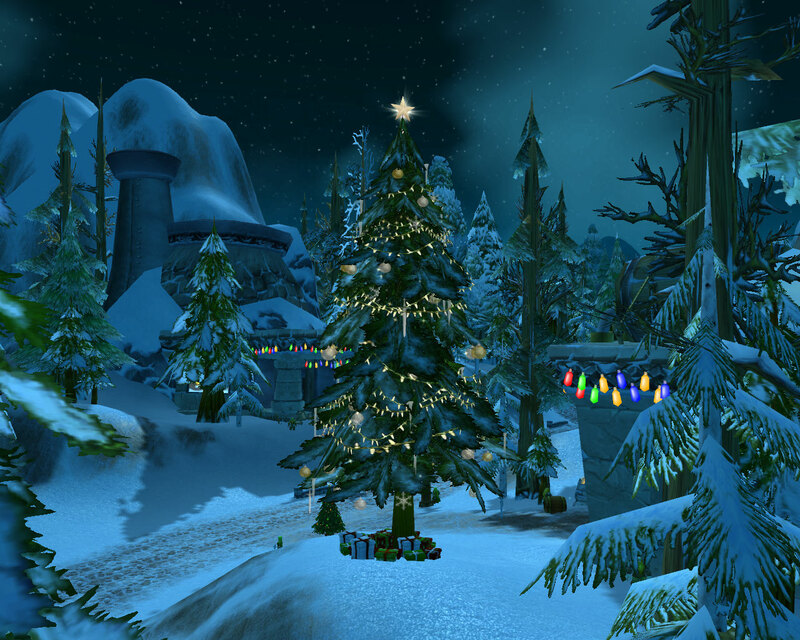 Happy Christmas and a Happy Winter Veil to all of you. The second I read the topic up for discussion as this week’s Blog Azeroth Shared Topic, I knew I had to take part. Legendaries have been a bit of personal sore spot ever since I became the “proud” owner of a Val’anyr, Hammer of the Ancient Kings. The lack of RP or indeed any “legendary” moments associated with said legendary became a bit of standing joke in my old guild. So when I read the following, suggested by Effraeti I was sold. When the newest Rogue legendary daggers were announced, Blizzard mentioned wanting to eventually create a legendary specifically for each class. This made me start thinking about what legendary I would want for my Shaman. Basically, for your post, you can be as detailed as you want. You can create pictures, compose the questline, design the stats and uses/procs. But most importantly, you want to build a legendary for your main character! So here is my legendary quest chain for a Night Elf Priest staff, “The Light of a Thousand Moons”. Given that it’s fairly obvious that most of the races who can play Priests have different belief systems (or at least call their Gods different things), I feel the legendary chains should be somewhat different for each race and whilst the rewards are basically the same, the staff itself should reflect those differences with distinct graphics for each one. I imagine the Nightelf staff looks like a twisted piece of wood covered in Physalis or Chinese Lanterns, all glowing with moonlight. Every so often, one two drifts off the staff and up into the sky, leaving behind a faint sprinkle of sparkles. This quest can be collected from any Priest trainer and sends you to Darnassus, to the Temple of the Moon. 2. Tears of the Goddess (picked up in Darnassus/hands in at Queen Azshara). On arrival in Darnassus, you discover that since the Highborne have rejoined the fold there have been rumours of a powerful gemstone, supposedly belonging to Elune herself. It’s mentioned in a few of the ancient texts they brought with them and the Priestesses of Elune wish it found before it falls into the wrong hands. Luckily current events made an echo of the past available. You are tasked with journeying to the Well of Eternity and talking to Queen Azshara. If anyone knows the truth of these rumours, it will be her. Nothing however is simple and Azshara is rather capricious. Before she will tell you anything, she demands a boon from you. The Queen tells you a story of her favourite trinket, a mirror set with precious stones and bids you retrieve it from it’s hiding place. Looking around, you discover a painting of a moon hung above a moonwell. Something glints under the water. However when you try and reach for it, your fingers just slip through the water. Moving around slightly, you end up standing in the pooling moonlight as it drifts down from the painting. Suddenly you see your reflection swimming towards you holding the mirror you seek. After teasing you for a bit, holding the mirror just out of reach, the reflection attacks you. Unfortunately once you move out of the pillar of moonlight, you can’t see it any more but it can still see and hit you. However because of aoe effects you have to move (it might look like you, but it sure doesn’t fight like you), so you need to move from pool of light to pool of light, dpsing down your reflection. Once you’ve killed it, loot the mirror from the corpse. 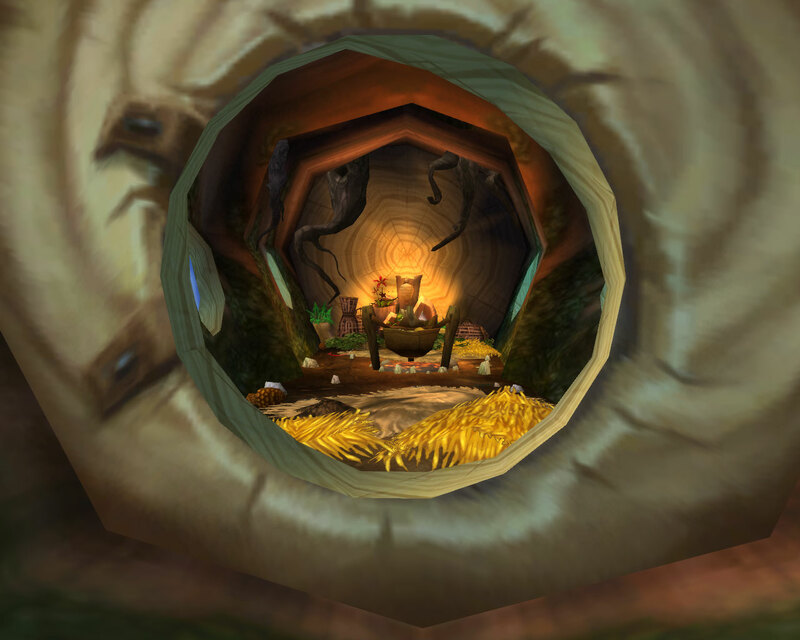 Return to Azshara, who after attempting to convince you stay with her and party until the world ends, takes her mirror and tells you of an artefact hidden away from sight, locked within the stone walls of a cave in Felwood. You return to Darnassus to tell the Priestesses what you have learnt so far. They decide with the help of one of the Highborne that the cave Azshara mentioned must be the one in Irontree Woods. (You get a cutscene here). It’s off to Felwood, with a Priestess of the Moon in tow. However by the time you rendez-vous at the woods outside the cave it’s too late, the Twilight lot have beaten you to it. 7. From a Distance. (Picked up from the Irontree Woods/hands in at the Twilight Highlands). After watching them carry a box from the cave, via a cutscene. Your companion asks you to use Mind Vision to spy on their conversation. After all there are far too many of them for the two of you to attack. You learn that the box is off to the Twilight Highlands to be closer examined. 8. The Light and the Shadow. (Picked up in the Twilight Hightlands/hands in at Darnassus). So off you go to the Twilight Highlands too. You track down the box in the Obsidian Forest and get to kill a cultist High Priestess. For this fight you have to switch between Holy and Shadow dps as she becomes immune to the one you are currently using after so many hits. 9. The music box. (Picked up/hands in at Darnassus). Once she is dead and you have possession of the box, you return to Darnassus. The box is opened and a tear shaped gem falls out. Lots of light comes from it and you hear music in your head, which no one else can hear. After much talking between the Highborne and Priests, it’s decided that the tear should be used to imbue a staff for you. You are sent to ask one of the Ancients for a branch to use. After asking you a few questions, he consents to you pulling a branch free and then tells you what to do next. 11. A catcher of Dreams. (Picked up in Darnassus/hands in at Dire Maul West). Then you have to take it Dire Maul and convince a slightly mad Highborne to imbue it for you so that it can catch moonlight. She takes a bit of convincing and pulls you into a dream world. You end up having to use mind control to overcome her, turning the visions she tries to set on you, against her. The reward from this is an epic staff, although right now, it just looks like a branch of wood, nothing special about it all at all (decent stats though). 12. The Light of a Thousand Moons. (Picked up in Dire Maul West/hands in Darnassus). Now the fun part starts. After all, you can’t have a legendary quest chain without lots of collecting can you. In order for the staff to be capable of receiving the tear of Elune, you need to empower it with the light of a thousand moons. 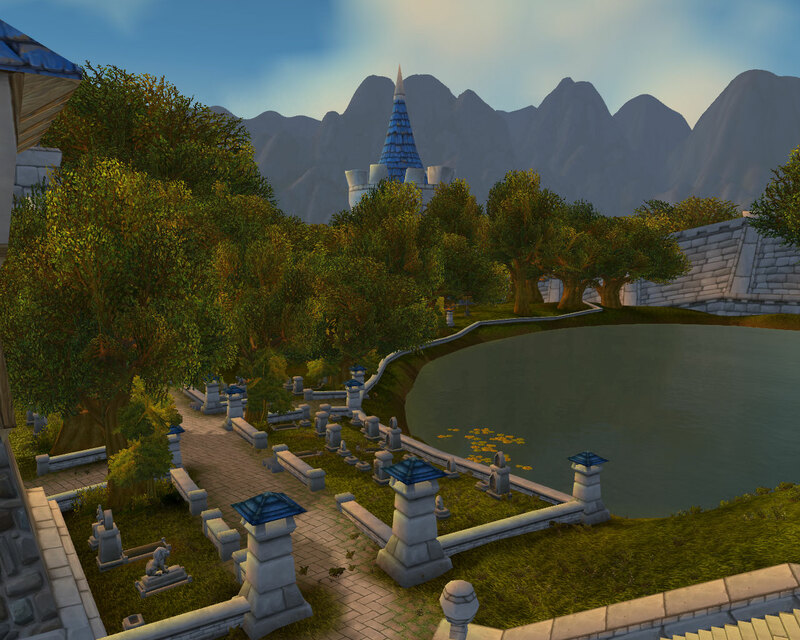 Moonlight has been trapped within certain places across Azeroth. 900 large pieces can be obtained from mobs within the Dragon Soul and the remaining 100 need to be caught from various locations where the reflection of the moon is still trapped within lakes, ponds, the sea and moonwells (think archaeology only the map doesn’t tell you where to look). As you obtain the moonlight, your staff starts to flower. Every 100 pieces it grows a cluster of lanterns until you hit the full 1000 where it’s covered in them. Once you have all 1000, you need to return to the Temple of the Moon and talk to Tyrande herself. You find out that now the staff contains the Light of a thousand moons, it’s a suitable vessel for the tear of Elune. You just need to get the tear hot enough so that it can be poured over the wood. Basically it’s time to return to the Dragon Soul for a bit of Heroic Deathwing slaughtering. Once he’s dead, you can loot some molten blood from his corpse which you take back to Darnassus. With a bit of hocus pocus, a lot of chanting and of course some moonlight, they melt the tear using the superheated blood and you get your legendary staff and all the goodies which go with it. First of all, the staff. I imagine that it would be a bit like Benediction/Anathema, so that it could remain best in slot for all three specs of Priests. Not going to go into specific stats however. The healing side would have to have a use, activate Holy Form. It’s effect would be purely visual but would allow you to glow golden just like the Priests in the Sunwell. So basically completely useless apart from letting enemy rogues know from the other side of the battleground that you are indeed a healing priest, pretty though. The shadow side would have a similar effect visual only effect, this time allowing your footsteps to glow shadowy (think like the footsteps of Illidan loot card). Also whenever you enter the Well of Eternity and encounter Queen Aszhara, she will either greet you as an old friend, telling everyone how you found her favourite mirror for her or demand that you give her the staff, pointing out that people called her “the Light of a thousand moons” and thus by right it belongs to her, your Queen. Since all legendaries these days need a mini-pet to persuade your guild that they want to help you farm the thing in the first place, what says Priest better than a Spirit of Redemption. It would drift after you using the same animation as levitate and should anyone/Willy/lil Kel’thuzad slaugher any critters in it’s presence, it will occasionally cast resurrection on them. When surrounded by live critters/other people’s mini-pets it will sometimes cast a heal on them. Finally, you would receive a title. As a Nightelf, you would become either Priest or Priestess of Elune. Things are a little slacky here at the moment, I’m besieged by presents that need wrapping, work stuff and a mountain of Christmas decorations none of which match each other. Anyway, enough excuses from me. Back on topic, this is Day 2 of Serenity Saz’s screenshot challenge. Again, this is definitely character dependent. 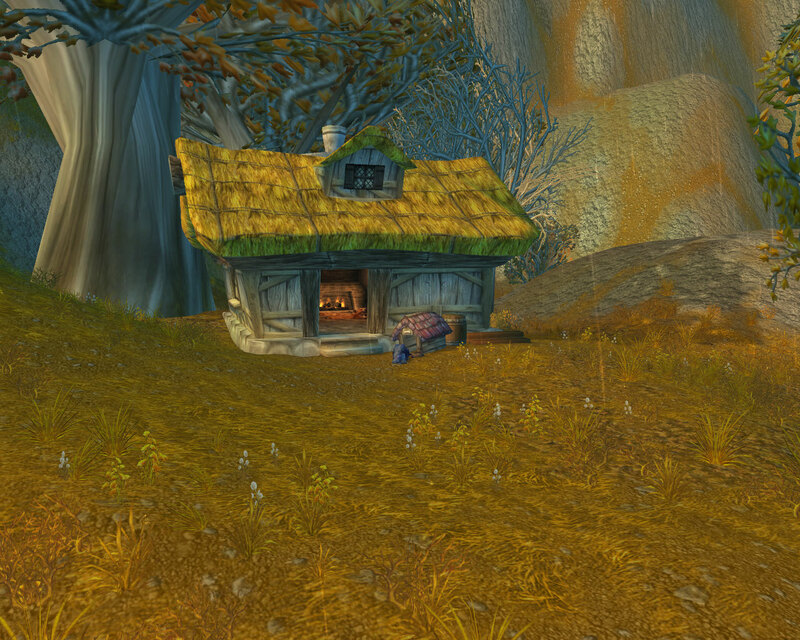 Sprout rather likes the simple life with lots of fresh air (after Gnomeregan, who can blame her). 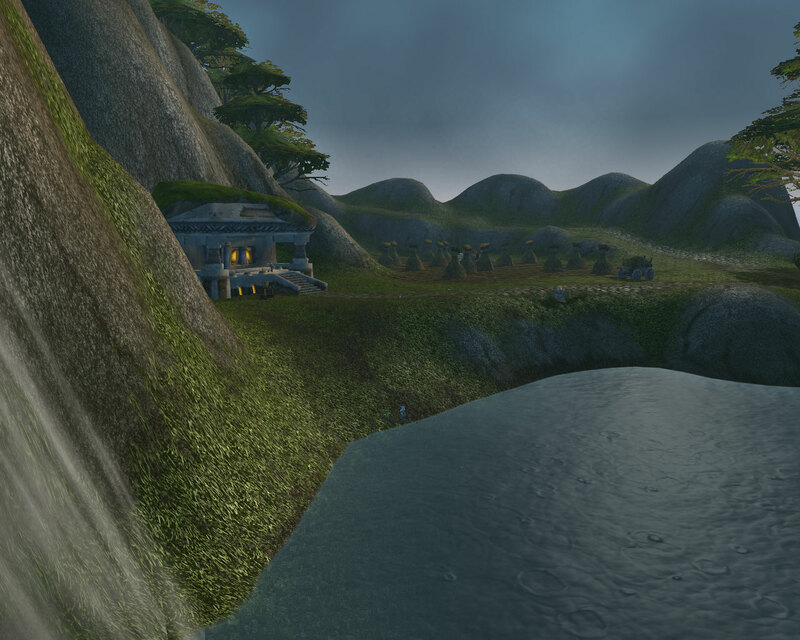 So where the mountains of Dun Morogh meet the Wetlands is perfect. 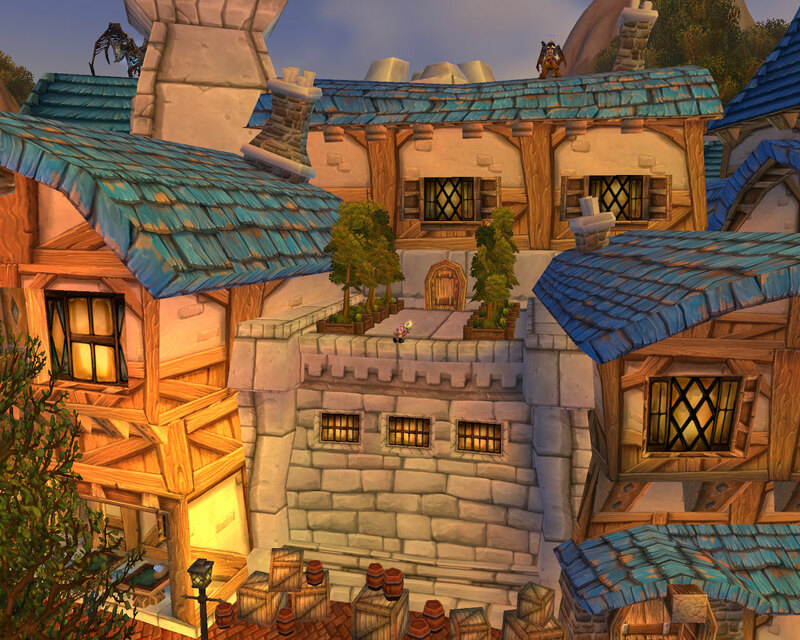 Before we could fly in Azeroth, I used to love flying over these little Dwarfen farms, wondering what it would be like to live there. It’s got everything she needs, a lake to swim in, a rather impressive waterfall and wonderful views. My Paladin, before the Light found her, intended to be a sailor like her father before her. Even now, she still wants to live as close to water as possible. There is an empty ship moored at Theramore Harbour and it would be her perfect home. The creaking of the timbers at night as the sea shifts beneath her remind her of her childhood. It’s cosy, warm and it’s location can change with the seasons. The reasons why are probably best not delved into. Winter Veil – You’re a Mean One! This is a new daily added this Winter Veil which has combined two of the old staples, rescuing Metzen the Reindeer and killing off the Greench so you can return the presents he stole. Instead of having to go to both Hillsbrad (for the Greench) and either Tanaris or the Searing Gorge (to rescue the Reindeer), now everything is handily in one location, Hillsbrad. It doesn’t matter who attacks him first because once he’s dead, the Reindeer handlers run off and the sacks of presents around the cave become clickable and you can just loot one. On my second character of the day, the Greench was already dead when I arrived but I could still loot a stolen present and Metzen the Reindeer was just hanging around waiting to be reassured he was safe. I imagine on a PvP server this could be a fun daily. 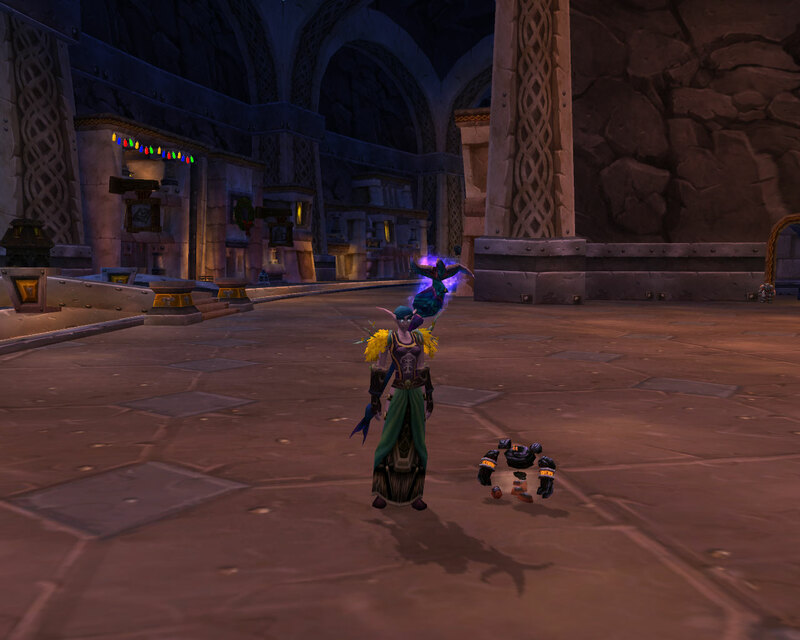 As a reward, you have a chance to get the new holiday mini-pet Lumpy, the Lump of Coal. In my second bag, I got a tiny green ragdoll. So I would go as far as to speculate that there is a chance to get a variety of mini-pets/toy related items from this daily. I’ve been skirting around Serenity Saz’s challenge over at World of Saz for a while now, looking at her entries and everyone else’s and thinking “ooh an opportunity for more screenshots” to myself. Finally I’ve allowed myself to give in to temptation and decided to join in. Each of my characters has their own favourite spot. Teasel (Resto Druid) likes masquerading as an oversized house cat down at Daphne Stilwell’s little bit of Westfall heaven. She keeps the rats and mice away from the apple harvest as well as hunting any murlocs who stray too far from the shore line. In return, she gets a kennel of her own plus as many apples as she can eat. 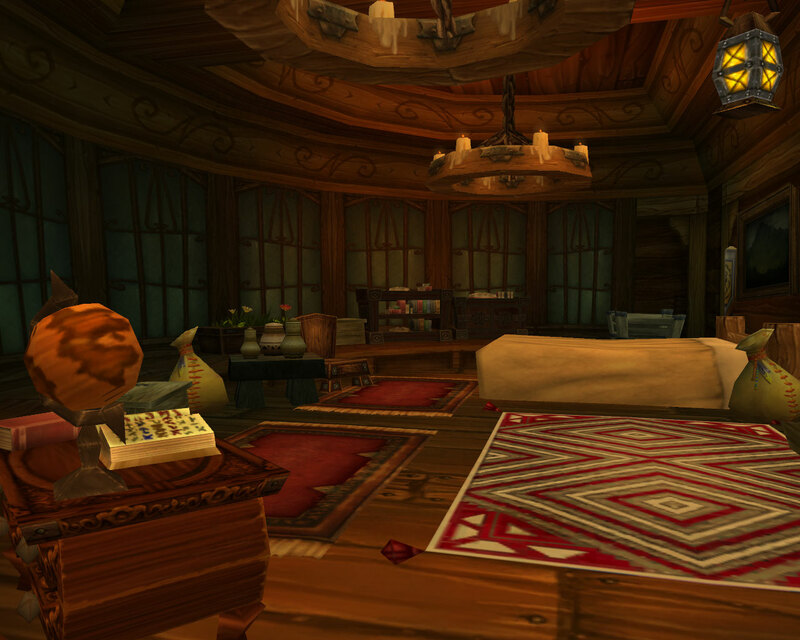 Sprout loves her balcony in Stormwind, especially when the sunrises and sets over the canal district. It’s high enough up to be away from the hustle and bustle of the busy city streets but not too far away from all of the action. Last but not least, Briarrose (my feral druid) divides her time between a log she acquired from a Furbolg in Grizzly Hills and visiting those charming Dwarfs in the Twilight Highlands. It’s compact but peaceful and makes a great hidey-hole for the days when you just want to curl up away from all the stresses of life. Class abilities are shared by all three specs. The other two columns are spec dependent. This is the updated version which includes most of the missing abilities from the previous one. Spells with * by their names are new additions. Mind Spike and Mind Blast have both turned up in the spell lists but as Shadow only. Not particularly happy about the PvP implications of that. Going to be interesting to see how Holy Nova turns out now that it’s Discipline only and is Disc’s version of Prayer of Healing. As far as I can tell, the only spells still missing are cure disease and shadow protection. However if we’re still going to get some form of disease removal I can see it being baked into the magic one, especially if they’re going to have cooldowns. Amazed that Mass Dispel is still on the list. Really thought with the prospective changes to dispel mechanics it would have been the first thing out of the door. Glad that it’s staying around though, can’t have paladins and mages thinking they are safe in their pesky bubbles/ice-cubes. The level 87 spell sounds interesting but possibly from a more PvP perspective than a raiding one, although I’m sure there will be uses for it in both spheres of the game. Spectral Guise: Your Shadow blurs into the darkness, leaving your true form behind. As a shadow you are invisible, but remain in combat. Lasts 6 seconds or until until your true form is hit by 3 direct attacks. 30 second cool down. Hopefully you’re a moving shadow, so sneaking off whilst someone is hitting you will be an option. Would be handy for getting a brief respite from bad tanking in 5 mans / LFR. If it does allow movement, Nightelf Priests might be able to have fun with it and Shadowmeld. If it allows you to carry on as normal whilst a shadow, i.e. healing away for those 6 seconds/3 hits, I like the concept a lot. Spirit Shell, the new Disc ability sounds interesting too. Creates an absorption shield on the target for 3864 damage lasting 8 sec. If the shield is untouched and expires, the target is healed for 80% of the amount. Although it comes with a 3 second cast time. I think we have to remember though, that in the case of quite a few spells, Holy Nova springs to mind, that the tooltips are odds on guaranteed to change.